When we see boxing fans talk about super talents we always make sure to mention WBC Light Flyweight champion Naoya Inoue (7-0, 6) who claimed a world title in just his 6th bout by stopping Mexican veteran Adrian Hernandez in 6 rounds earlier this year. In that fight Inoue announced himself on to the world stage in impressive fashion as if to tell the world "I'm a future legend"
Today Inoue effectively waved good bye to the 108lb Flyweight division as he successfully defended his title beat up the game but limited Samartlek Koietgym (17-5, 5) to record his first defence. Inoue was in charge from the opening round and it was incredibly clear that the two men were in completely different leagues to each other. Samartlek, to his credit, refused to be intimidated and tried to fight back, even landing some flush power shots of his own, though all they seemed to do was bounce off Inoue as if they were nothing. In some ways it was disappointing that Inoue wasn't showing off his defensive ability though in other ways it was a case of the Japanese youngster showing how exciting he can be when he's on seek and destroy mode, similar to how he was against Jerson Mancio. 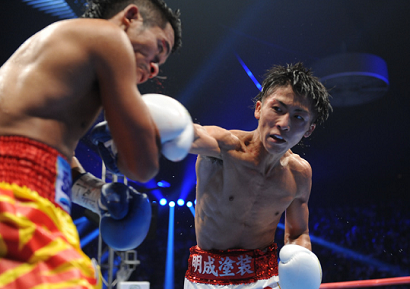 As the bout progressed Inoue became more and more aggressive, dropping Samartlek in round 4 and then beating him down over the following, one sided, rounds. He went from landing thudding single shots that snapped back Smartleks head to full blown combo's of power shots that were as genius as they were sickening. The head and body of Samartlek were targeted with the "Monster" switching between the two at will and punishing Samartlek every time the Thai threw a shot in anger. The combinations just got better and better from Inoue who finally forced the referee to step in round 11 after landing, flush, with a monstrous right hand. It was the straw that broke the camels back and although Samartlek was on his feet he was in a major hole on the scorecards and taking a really vicious beating. It was clearly a mercy stoppage but it was the right thing to do considering how many flush shots Samartlek had been eating and how little he had been firing at Inoue. Prior to the fight Inoue had made it clear that he had been struggling to make the 108lb limit and it now seems certain that he will vacate Light Flyweight to begin his campaign at Flyweight. At 112lbs we expect to see Inoue tighten up his defence though there is no doubt he's going to be a real nightmare to anyone at Flyweight. Hopefully no Flyweight looks at this performance and thinks that they saw the best of Inoue, they really didn't. What they saw was a man looking to excite fans, not show off how truly exceptional he is.